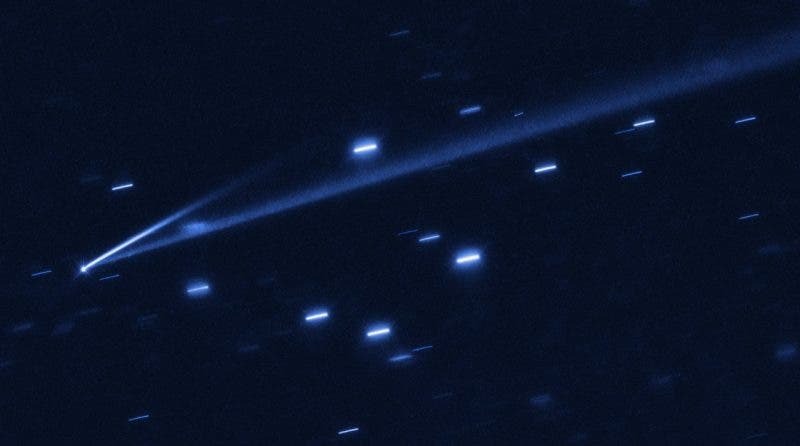 A Hubble Space Telescope view of asteroid 6478 Gault, showing two comet-like tails of debris. Credit: European Southern Observatory. Almost 214 million miles (344 million km) from the sun, an asteroid is doing its best comet-like impression. Astronomers at the University of Hawaii have discovered an asteroid that is spinning itself into pieces, generating two debris tails of dust in the process. First discovered in 1988, the first signs that the asteroid was self-destructing came on January 5. Using NASA’s Hubble Space Telescope, along with a variety of ground-based instruments in Hawaii, Spain, and India, astronomers found two debris tails trailing 6478 Gault in the main asteroid belt between Mars and Jupiter. The observations are the first pieces of evidence of Gault’s misbehavior and suggest that asteroids are dynamic and can ultimately disintegrate due to the long-term subtle effect of sunlight, which can slowly spin them up until they begin to shed material. In Gault’s case, the asteroid is doing a speedy rotation every two hours, so fast that Gault is flinging material off its surface and into the void. Hubble revealed the tails to be narrow streamers, indicating that the dust was released in short bursts, lasting anywhere from a few hours to a few days. These sudden events puffed away enough debris to make a “dirt ball” approximately 500 feet (150 meters) across if compacted together. One tail was found to be approximately 500,000 miles (800,000 km) long by 3,000 miles (4,800 km) wide. The smaller tail spans about 125,000 (200,000 km) long. Watching an asteroid come unglued like Gault gives astronomers the opportunity to study the makeup of asteroids without sending a spacecraft for samples. Analyzing an asteroid’s ingredients as they are spread out into space can offer astronomers a glimpse into planet formation in the early solar system.